Right after I joined Bee Talents some of my teammates noticed that one of my strengths is effectiveness. Thinking about what makes me productive, tasks planning, to-do lists and inbox automatization first come to my mind. It might be also my attitude - I really enjoy making “ticks” on my to-do lists to make sure I did everything. Here I’m sharing with you some of the examples that drive my effectiveness. We all want to be effective on a daily basis. We keep on asking (or at least I do) ‘what can I do to make our my faster or easier while providing higher quality?’. Here’s my shortlist of simple tips or “DOs” for boosting your effectiveness at work. Let’s get started! You don’t like cleaning up, do you? Have you heard that Einstein approved messy desks just because great minds always have them? Great! Just stick up to this and keep your desk cluttered. But nowhere else. You need to clean all the tools you use at work. As a recruiter, I mostly use LinkedIn RPA, Lever ATS with all the recruitment processes, Toggl for the time tracking, Slack for communication and – of course – inbox and calendar (that’s a G-Suite thing). If I had the mess there, I would get lost and have to search and double check everything (which would be a time waster, obviously). To avoid it, I recommend you to update every tool right away and keep your inbox, Trello, ATS and LinkedIn clean (in a sufficient time). I always keep everything up to date and I have only current projects, processes, candidate statuses and future calls on my dashboard. If you can’t do it now, book a slot in your calendar when you can focus on keeping your ongoing tasks in order. When I start a new project, I always create a new label with the name of a client. While looking for something, I can choose just one label and have a full list of emails connected with that specific client. I also put “Office” label for all stuff connected with Bee Talents. There’s also “External newsletters” label – I like reading them in my free time. That’s why I collect all newsletters in one place. And, obviously, I don’t divide email manually into labels – I have filters which automatically add messages to direct folder with the label (#automatization!). At Bee Talents, we always personalize messages to candidates. However, there are some other messages that we don’t need to personalize, eg. GDPR agreements or the summary of formalities mentioned during the call. I’ve got templates prepared in Gmail. If you think that could be useful for you too, just put the content into your mail and then click options and “Given answers (templates)”. You should be also aware of turning them on in “Settings” in “Laboratorium” or now – “Advanced”. It can really speed up emails sending process (and you don’t need to look for them in your disc or wherever you keep your documents). Usually, I use Trello to organize my projects but sometimes it is necessary to divide the project into smaller parts, connected with a specific day or week. In our team, we decided to introduce an additional table (shared on our disc) with all our projects from Trello but divided into smaller repeatable tasks. On Friday, I plan all my work for the upcoming week. When the task is done, I fill the proper cell with green color. If it was planned but hasn’t been done yet then red is the color to go. Thanks to it, I can easily check which tasks are more difficult to me. 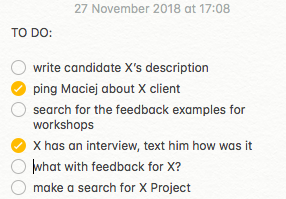 I really recommend you all that workflow, even just to check how good you’re in planning! You might not find Trello or the above-mentioned table useful. If so, you can prepare a quick checklist on your computer. As we work on Macs at Bee Talents, I need to say I really like its built-in Notes. Why? You don’t need to have an Internet connection to use it. You can change regular notes into “ticking” to-do-list mode and mark your tasks as done with just one click. Anyway, you can still use Google Keep or Google Notes if you’re online. It’s not a breaking news that our work very often depends on others tasks. If you want to have your work done you need to remember about pinging your teammates (reminding of task you need them to do for you). Did you know that candidates/clients are more likely to answer you after the follow-up? Sometimes they just miss your first message so you can boost your chances if you text them again. Somebody told you that he/she is not interested in your offer at the time? Just ask them when you can get in touch with them again and put it in your calendar. Even if it’s 6 months period (at Bee Talents we have many processes – maybe in a half of the year you will have new but quite similar projects to get that candidate’s interest). Put your tasks in blocks. For example, I have a meeting block on the mornings, after that I need a time for conceptual or operational work and calls with candidates in the afternoon. I suggest it to every recruiter – morning and afternoon calls mean that you have time to collect GDPR agreements. Also, you can prepare a candidate’s description for the client that day or the day after. When you don’t need to switch the context all the time, your work is more effective. You can also find out more about managing your calendar in this article by Ola. You can’t be effective all day long. None of us can. You need to take a break (or breaks). At Bee Talents there are 45 minutes which we can track as a break during the day. I like to take 3×15 minutes or 1×30 minutes. At this time, I can reset my mind, go out and take a walk or eat something. I usually take breaks between context switching. Break basically means that you can take your time and relax. Thus, you’ll be more productive afterward. Just try if it works for you too. Maybe not fully remotely but at least – once a week (of course if you can). I usually work remotely on Thursdays. Why? Because there are no meetings in the office then. I stay at home so I can focus on writing messages to candidates (my office environment doesn’t distract me), doing internal things, preparing presentations or writing blogposts and so on. Maybe you also need this type of working? Just remember to tell about your remote day your teammates and leave a note in your calendar to be transparent. Someone said that you shouldn’t start your work with reading your inbox. But you can do it while commuting to work. You can also read a book – for personal and work goals. It depends on you. But after all, just be agile. Even the best process won’t work if it doesn’t fit you. So test, try, check and change everything to find your way. And – before you eat that frog – make small and fast steps to check how much you have already done. Just remember, everybody is different and different solutions work for us. It means that not everything from this list above will suit you. You can try these tips, introduce it to your workflow but most importantly – find your own ways to raise effectiveness. Maybe you already have some habits? I’m more than curious to learn about them, so share them in comments below!